The Prussian military theorist Carl von Clausewitz famously observed that war is a continuation of politics by other means, an aphorism that is universally taught at the nation’s war and staff colleges. It implies that there is an intimate relationship between what happens on the battlefield and what happens in the capitals of the warring states, as well as those of neutrals and allies. In later chapters he expands on the idea, laying out various situations of relative strength and motivation among combatants and the way that the policy/strategy interface is affected.1 Given the prominence of this idea in his book, Clausewitz admits the difficulty of grasping the logic of how policy and warfare interact with one another, stating that in strategy “…what is more difficult to grasp are the intellectual factors involved. Even so, it is only in the highest levels of strategy [presumably where military strategy meets policy] that intellectual complications and extreme diversity of factors and relationships occur.”2 Having made that admission he goes on to simplify the matter by making an assumption about the coherency of the political level: “Once it has been determined what a war is meant to achieve and what it can achieve, it is easy to chart the course.”3 If only things were that straightforward. Clausewitz thought that a good way for military operations to be harmonized with national strategy and political imperatives was for the strategist to lead the forces in the field, ala Frederick the Great.4 Abraham Lincoln actually dabbled with the idea when he took a trip down to the James River to check up on McClellan during the Peninsular Campaign.5 However, since that brief excursion, American practice has been for the president to stay close to the political front, even though being Commander-in-Chief, and choosing to delegate field command to a senior military officer. Depending on the president’s approach, factors such as policy, politics, and military strategy could be coordinated in Washington or perhaps, as in World War II, at allied conferences such as Arcadia, Casablanca, and Tehran. In theory, as Clausewitz presumes, the purpose and objectives of the war are outcomes of the political process and military strategy that are concocted, ideally, in consultation with senior military leadership. The resulting strategy would be converted into orders which the fighting forces would carry out. However, history teaches us that coherency in the relationship between policy and the military instrument (which is somewhat simplistically termed here as the strategy/operations interface) is both an aspiration and an assumption on the part of most governments. The intellectual complications and diversity of factors Clausewitz mentions often put such coherency beyond reach. This represents a serious challenge to historians seeking to document causes and effects, but even more so it is an obstacle to game designers seeking to incorporate the interplay of both levels of war. In order to prepare the way for a discussion of potential game methods to explore the interface, we will work our way through the levels of war in a temporal manner, proceeding from the beginning of war, through its execution, and then to the endgame. The relationships of the levels (the people and organizations responsible at each) and the challenges to gaming them change a bit at each stage. 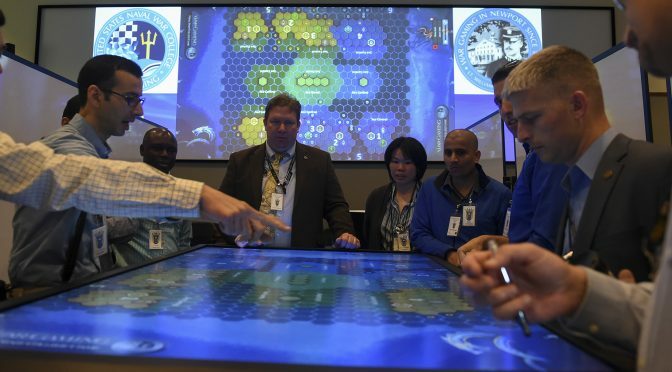 In current operational-level gaming practice across the Department of Defense (DoD), Blue (U.S.) players generally have a free hand once they are given the starting scenario and perhaps a campaign plan. Any guidance from either the game control cell or a “council of elders,” while frequently advertised as guidance from higher authority, is almost always based on regulating the progress of the game rather than an attempt to explore the strategy/operations interface. The net effect of this “strategic vacuum” is the tendency for players to focus at the tactical level, which is what most Blue players, regardless of service, are most comfortable with. Control tries to keep them oriented on the operational level by various means, including by providing broad move feedback vice detailed battle reports. On the other hand, for any number of reasons it is common for Red (the enemy, whoever that might be for the particular game), especially free-play Red, to pitch their moves at the strategic level. One reason is that Red is frequently weaker in conventional military power than Blue and so seeks asymmetric avenues of advantage. Red also tends to be represented by fewer players who are organized into a single cell, thus facilitating multi-level thinking. This creates a problem for game umpires who must reconcile asymmetric move inputs: operational from Blue, and strategic/tactical from Red. The frequent response is to factor out Red’s stratagems, perhaps informing Blue of them, and concocting operational-level assessments based on presumed Red moves at that level. If Blue’s political-level responses and resulting guidance to operational-level players is not provided in the feedback, an opportunity to incorporate the strategy/operations interface is lost. Regardless of how the strategy/operations gap takes form in operational-level games, perhaps the biggest vacuum is in addressing the endgame – how the war ends, a major gap in the planning for OIF. True also for strategy games, the arena of what might be termed “Phase IV”6 is surrounded by a moat of technical and intellectual difficulties that all but isolates it from routine incorporation into gaming. Regardless of how and why a war starts, actions by both sides might serve to transform the nature of the conflict, thereby confounding any pre-war calculations of how it might end. Among the difficulties is how long the war lasts. Desert Storm terminated in roughly the time a week-long wargame would run. Seventeen years after its onset, Afghanistan still simmers. Wars are propelled by disputes, the nature of which heavily influences how long hostilities drag on. Successful military operations, in and of themselves, are not always a sufficient cause for war termination. This therefore presents procedural difficulties for gaming. Even if a game is played out until one side achieves some kind of military checkmate, the matter is not necessarily settled. Recreational wargames, especially the game board style, can be played out to a decision. In fact, that is the whole idea behind them. However, the decision is usually a function of victory points accrued via operational success, thus the operations/strategy interface is hardwired into the experience.7 In free-assessed games, typical of most large military professional games, it is rare for a game to arrive at a strategic decision. One of the reasons is mechanical, in that the game is arbitrarily limited in moves by the amount of time players have, usually several days to a week. Moreover, game objectives normally focus on specific operational-level issues, obviating any motivation to press for strategic closure. Then too, the technique of free assessment, the use of human umpires to assess moves based on their judgment, makes “who won” either moot, or at least a subjective matter. Carl von Clausewitz, On War, edited and translated by Michael Howard and Peter Paret, (Princeton, NJ: The Princeton University Press, 1976), Book Eight, Chapters 5-8, pp. 601-616. Craig L. Symonds, Lincoln and His Admirals, (New York: Oxford University Press, 2008), pp. 145-153. Joint Publication 5-0, Joint Operations Planning, 11 August 2011, p. III-41. There are some games that do address the operations/policy interface, an example being Persian Incursion, a board game designed by Larry Bond, et.al. that employs cards depicting various political conditions attendant to Israeli strikes on Iranian nuclear facilities. See https://clashofarms.com/files/PI_Sample%20Rules.pdf for a description of game mechanics. The doctrinal partitioning of war into three levels in the U.S. is a relatively recent occurrence. The Army’s 1982 Field Manual 100-5 Operations introduced the notion of an operational level in between strategy and tactics.1 The operational level, according to doctrine – and subsequent practice – is the level of command at which campaigns and major operations are planned and directed. This doctrinal development simply provided a theoretical basis for a command structure that had existed since World War II. Between fighting units and their direct commanders in the field and at sea, there were established theater headquarters that not only oversaw, coordinated, and supported large and widely dispersed forces, but also coordinated theater strategy – the campaigns – with the national command authorities in Washington. In WWII the emergent arrangement in which theater commanders such as Eisenhower, Nimitz, and MacArthur worked with an ad hoc joint staff that consulted routinely with President Roosevelt worked well enough in the context of a total war against the Axis. Deft political management during the war and especially in the end game produced, if not a perfect post-war world, at least good outcomes in West Germany, Italy, and Japan. Operations were governed by strategy, set in Washington, which was where political and military feasibility met. After the war, the U.S. established a permanent globe-girdling theater command structure to coordinate a potential global war versus the Soviet Union, manage the geopolitical strategy of containment, and execute the oversight and support of limited wars that broke out, such as in Korea and Vietnam. The problem, as compared to World War II, was that those wars were conducted in the shadow of the U.S./USSR nuclear standoff, thus taking certain military options off the table. Moreover, those two wars and all subsequent ones were fought for limited objectives. These factors called for a more detailed interaction among policy, military strategy, and operations than was required in World War II. Sometimes this resulted in micromanagement, as in Lyndon Johnson’s approach to bombing in Vietnam. After that war, the services, especially the Army, embarked upon an effort to revamp their doctrine and cultures, including the notion that Washington should delegate more authority for running operations to theater commanders. The development of the operational level of war aided in this change. However, the development of operational art as a key pivot of U.S. military doctrine had the effect of turning theater commanders into regional military “proconsuls.”2 This served, in the view of two Army War College writers, to drive a wedge of sorts between strategy (to include the policy side) and operations (the conception and design of campaigns) to the point where it “… reduced political leadership to the role of ‘strategic sponsors,’ quite specifically widening the gap between politics and warfare.”3 Others have attributed the inability of the United States to achieve definitive victories since 1945 to defective strategic leadership in Washington.4 Both problems have infected U.S. strategy since at least Vietnam, being perpetuated by a gap in understanding of the connections between operations and strategy. One manifestation of this gap is in the vulnerability of administrations to the lure of what might be termed “sure fire” victory concepts. Since at least the dawn of the air age there have been warfare prophets that assert in an a priori manner that particular technology-based concepts, like strategic bombardment or network-centric warfare, will confer an unassailable advantage to their users and produce rapid victory. Such concepts are alluring to political decision-makers that find themselves under pressure to resolve a vexing international dispute on favorable terms. Skeptics have a difficult time countering the claims of adherents, since there usually exists no historical counter-evidence as the concept and its supporting technology are new. The most notorious recent example is the 2003 invasion of Iraq. The policy/strategy framework for Operation Iraqi Freedom (OIF) was founded upon Defense Secretary Donald Rumsfeld’s notion that new technology would produce “shock and awe” and allow the invasion to be carried out with far fewer forces than had participated in 1991’s Desert Storm. “Faster, lighter,” were his buzzwords, and he believed intelligence and hi-tech gadgetry would play a more important role in future conflicts than boots on the ground.5 Blatantly missing from the strategy was any plan for establishing order after Baghdad was captured, which resulted in chaos and an eight-year counterinsurgency operation. There were indeed people in the national security community that advised caution based on the politics of using military force, such as former Central Command commander Marine General Anthony Zinni and Congressman Ike Skelton, who advised the administration that they should not take the first step without considering the last.6 However, their concerns fell on ears deafened in part by the administration’s idea that the war would be quick and easy. In other words, it may fall increasingly on the military to reconcile the gap between strategy and operations, a solution far from optimum but likely better than ignorance of the strategy/operations relationship in both Washington and the field. Wargaming is deeply institutionalized within the military, so it is within the military gaming process that education and analysis of the relationship must at least start to occur. To close the existing gap, national security practitioners, uniformed and civilian, should develop a feel for the dynamics of these interactions such that they can approach decisions to go to war, war strategy, campaign design, and post-war arrangements much more sagaciously. Widespread inclusion of such an interface in wargaming would help close the gap. Carnes Lord, Proconsuls, (New York: Cambridge University Press, 2012), see Chapter 1, “On Proconsul Leadership,” pp. 1-22 for a discussion of delegated political-military leadership in the American system. Justin Kelly and Mike Brennan, Alien: How the Operational Art Devoured Strategy, (Carlisle, PA: Strategic Studies Institute, September 2009), p. viii. David C. Gompert, Hans Binnendijk, Bonnie Lin, Blinders, Blunders and Wars, (Santa Monica, CA: Rand Corporation, 2014). p. 167. Read Part 1 on Combat Training. Part 2 on Firepower. Part 3 on Tactics and Doctrine. Read Part 4 on Technical Standards. Read Part 5 on Material Condition and Availability. Read Part 6 on Strategy and Operations. Exploring the future of conflict while preparing to wage it is a daunting task. Military forces are constantly attempting to perceive how war is evolving, and subsequently orienting their institutions along that vision in order to be ready. However, what makes a military unique from most other organizations is that it does not execute its primary function (aside from deterrence) until war breaks out. This makes it especially difficult to prepare for major war since it is a rare experience that usually cannot be fully understood until it finally occurs. When war arrives, years of preparation are immediately put to the test, and deficiencies are violently revealed. How well a military has prepared for conflict in peace helps determine how much it will have to adjust in war. In this sense, force development is the peacetime equivalent of wartime adaptation. The term force development has been used here in place of a term that is often used to describe military evolution, “modernization,” which tends to have an inherent bias toward high-end capability and not full-spectrum competence. The idea of “modernizing” implies a focus on pushing for better technology, yet “modernization” 20 years ago could have meant preparing for low-end conflicts where technological superiority conferred little advantage. The term “modernization” can also encourage a habit of using the procurement of newer systems as a major milestone for progress, and promote the fallacy that once new technology is bought and fielded a shortfall has been filled or an advantage has been gained. What has to be recognized is that once the taxpayer has purchased new military tools the warfighter has an obligation to execute follow-through in the form of developing new tactics and training around those tools. Otherwise, the benefits or pitfalls of new technology will not be fully realized. Force development as it has been described here intends to convey that the institutions that focus on tactics and doctrine, not procurement, are what primarily drive competitive military advantage. It intends to convey that operator understanding of how to execute and evolve tactics and doctrine is how to best define warfighter competence. Tactics and doctrine must not only be well-understood by the warfighter, they must be thoroughly validated so that they actually make sense in application. The professionalism of the force will punch far below its weight if warfighters are well-versed in warfighting concepts that turn out to be brittle. Force development still occurs even in the middle of war, but it takes on a far more urgent character. Militaries are often forced to innovate and experiment in the middle of conflict, and spend precious time and resources on force development when those resources could be applied to the battlefield. However, even in the middle of a war (or especially so) militaries often choose to make those considerable investments because wartime adaptation can be decisive. Wartime force development can seek to correct deficiencies revealed by combat experience, rapidly field new capabilities built on fresh tactical insight, or remain ahead of the curve in a general sense as all sides continually pursue better tactics. If a force can enter a conflict with sturdier warfighting concepts then it can focus more of its wartime force development on proactive evolution instead of painful corrective action. An example of failed peacetime force development and a subsequent effort to urgently correct deficiencies in the middle of war can be found in the U.S. submarine force. The submarine force entered WWII with ill-conceived concepts of operation, a highly risk-averse culture, faulty weapons, and underdeveloped tactics. Submariners at first expected to mostly use sonar to attack their targets (a dubious tactic at the time), were equipped with torpedoes that often failed to detonate upon impact, and had little doctrine for unrestricted anti-submarine warfare. These deficiencies forced American submariners to experiment with new tactics and doctrine in the midst of conflict.1 This force development failure happened in spite of the interwar period wargames, Fleet Problem exercises, and Admirals King and Nimitz both having a decent amount of submarine experience. U.S. naval commanders even had the especially useful experience of watching German U-Boats earn combat experience as they sunk hundreds of merchant ships in the Atlantic before America entered the war. However, as a result of poor force development, U.S. submarines punched far below their weight for many months while the rest of the force still relied heavily on them to take the fight to enemy home waters. The U.S. military suffered a historically painful force development experience in recent years. Despite after crushing the initial opposition in the opening phases, the wars in Iraq and Afghanistan began to falter hard as insurgents made impressive gains in territory and manpower. The counterinsurgent fight proved to be extremely difficult in these countries due to the complexity of interagency operations, unfamiliar frontline roles, war-torn societies, and a host of many other significant challenges. But as the Department of Defense sought to adapt itself to a difficult fight it at least had the benefit of history. Insurgency is perhaps the most common form of warfare, with around 100 such conflicts in the past century.2 There was no shortage of case studies to learn from. The Navy’s current situation couldn’t be more opposite. High-end fleet combat between great powers using precision weapons has never happened before. This is why realistic exercising for the sake of experimentation and investigation is so important. Because there are zero historical examples to draw on, the Navy must dedicate an especially large effort toward building its own case studies of networked fleet combat actions in the form of unconstrained, large-scale exercises. However, the Navy’s long tradition of highly unrealistic exercising translates into very poor institutional understanding on many specifics of future combat. The Navy’s chronic lack of realistic exercising and its bloated certification system reveal a force development enterprise in disarray. The Navy has many institutions that produce tactical memoranda, concepts of operation, and doctrine, all of which seek to evolve the force. Yet many of these ideas have not been effectively validated because exercises were not used to meaningfully test ideas in realistic environments. The few tactical and doctrinal ideas that did have the opportunity of being tested in large-scale exercises were likely pitted against handicapped opposition forces. This undercuts the process tremendously. Scripted exercises that guarantee easy victory are far more likely to produce brittle tactics and doctrine. These concepts will rarely experience multiple rounds of revision and refinement born from a series of iterative exercises. Clearly there will be many rounds of trial and error if one is testing warfighting ideas against capable opposition. As a result of using weak opposition to validate warfighting concepts many of the Navy’s most important wargames, tactical memoranda, concepts of operation, and doctrine never left the level of a rough draft. Even if it was effectively validating concepts through realistic exercises, the Navy’s ability to teach the average Sailor new tactical lessons is severely handicapped. Warfighting certifications are supposed to institutionalize the Navy’s force development, but the bloated character of the certification system is strangling the Navy’s ability to become a learning organization. Tactical and doctrinal products cannot turn into meaningful learning if they take the form of just another certification event or inspection Sailors have to check off among the dozens if not hundreds of other events. Many Sailors already feel it is virtually impossible for them to get good at the numerous certifications that have been forced upon them. Because of this, institutions that work on producing tactics and doctrine are having many of their efforts effectively wasted because their products simply cannot compete for time within the certification system. And even if the Navy somehow made enough time for Sailors to effectively study tactical and doctrinal publications, they are being given little opportunity to use meaningful exercises to distill those lengthy publications into actionable and digestible insights. The scarcity of meaningful exercising and the bloated certification system have combined to produce numerous warfighting ideas that are untested, unrefined, and untaught. Under these conditions, the U.S. Navy is hard-pressed to define requirements that can remain durable in great power war. There should be absolutely no doubt that an incredible number of latent problems have been accumulated over the years as a result of lax force development and using weak opposition to validate concepts. If the Navy decides to embark on a serious path of transformation for the high-end fight then it must steel itself for difficult corrective actions, stubborn bureaucratic pushback, and the possibility that it may be stuck with tactically disadvantageous investments that could prove fatal in war. Soon after leaving his term as the first president of the Naval War College he founded, Stephen B. Luce grew frustrated. Just before opening the War College, Luce commanded the North Atlantic Squadron, a unit he used to test warfighting concepts through at-sea experimentation and exercises. After finishing his term at the War College, Luce came back to the Squadron, hoping to conduct more exercising in pursuit of new tactics. Others had something else in mind. After rejoining the Squadron, Luce’s attention was almost immediately diverted by higher ups. He was ordered to handle brewing fishing disputes that consumed much of his attention for the first year of his command. Unrest in Haiti prompted the Navy to detach one of his ships to the Caribbean. A request from the State Department took another ship. Not long after Luce’s flagship was also stripped from his command to serve elsewhere, the Navy Department inquired about his summer training plans. 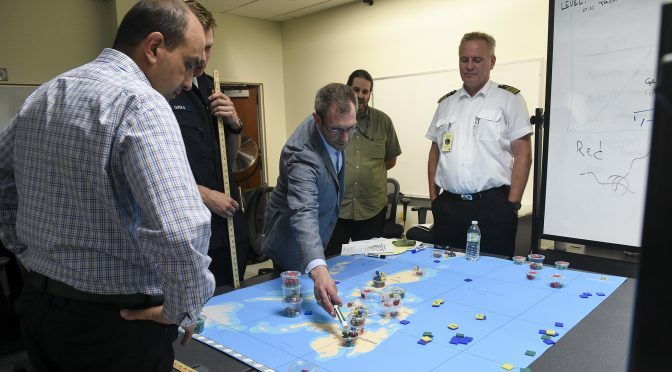 The Navy continues to use wargaming to make major decisions and provide important insights. However, the validity of wargaming is being diminished by both the rising complexity of networked warfighting and a lack of real-world testing. The Navy is heavily leaning on a tool that is growing ever more dependent on real-world testing for the sake of accuracy, yet the Navy’s exercise agenda appears to rarely reflect major wargaming initiatives. Wargames, because they are virtual simulations of conflict, operate on a far wider spectrum of tactical assumptions than real-world exercises. Attempting to recreate tactical accuracy in wargames stretches them to their limits and takes considerable effort. 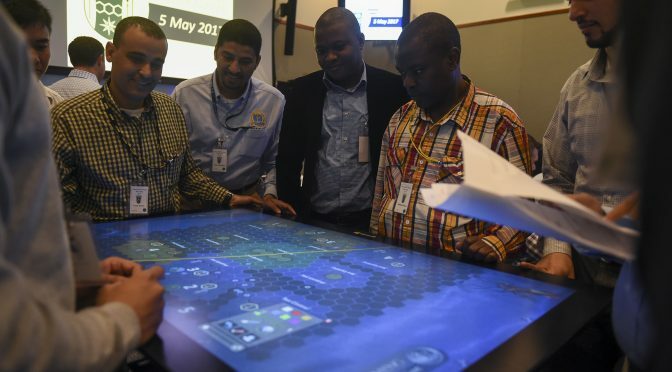 High-fidelity wargames can be extremely intricate programs, requiring meticulous inputs, powerful processing capabilities, and are governed by many rules. Elements of chance can be introduced through randomized results, similar to a dice roll. As powerful and complex wargames are, they are still only simulations, and cannot come close to the realism of exercises. Exercises have to be used to refine wargames in a continual feedback loop for the sake of refinement, and to keep wargames grounded in reality. Many types of wargames are not supposed to be static, but fluid simulations that are continuously updated through exercises to improve their realism and ensure their accuracy. Significant tactical discoveries should also be enough to prompt the replaying of certain wargames. Exercises can help wargamers more precisely understand the very things that make a wargame artificial, such as factors that must be reduced to dice rolls, inputs, and rules. In short, exercises help wargamers understand their assumptions. The complexity of Information Age warfighting is one of the most powerful forces diminishing the value of tactical- and operational-level wargaming. As warfare becomes more complex, it becomes more difficult to simulate. This holds true for both exercises and wargames, but it is especially more true for the latter given they are simulations and not real maneuvers. The world of inputs required to accurately simulate warfare has grown to unprecedented heights, especially because so much decisive tactical space now exists within electronic means that are especially difficult to replicate in a simulation. Networked warfare involves many complex and nuanced electronic interactions between opposing forces. The nature of sensing, deciding, and engaging has become an ambiguous electronic battlefield. Opposing sides will seek to jam, intercept, and deceive communications and sensors across the spectrum. Cyber attacks will seek to cripple systems, collect sensitive information, and proliferate throughout infrastructure. As an anti-ship missile closes in, its seeker can use a variety of sensors to pinpoint its target, and a variety of countermeasures such as electronic warfare will respond in an attempt to confuse the seeker. Bandwidth limitations will shape decision-making, and data will be processed and refined by both man and machine. Operators and autonomous actors will attempt a variety of real-time workarounds in response to electronic attack, and these attacks can cause them to lose confidence in their equipment and each other. It is already extremely difficult to replicate many of these network combat dynamics in exercises, and for wargames many elements are outright impossible. While a wargamer can make due by using dice rolls to distill combat ambiguity into specific outcomes, this will not often satisfy the tactician or the trainer. Even the supposed strengths of wargaming are challenged by networked warfare. According to Perla, wargaming “is a tool for exploring the effects of human interpretation of information. Wargames focus on the decisions players make, how and why they are made, and the effects that they have…The true value of wargaming lies in its unique ability to illuminate the effect of the human factor in warfare.”5 Yet so much decision-making in modern war is completely beholden to electronic nuances that wargames struggle to replicate, and decision-making is often the direct objective of electronic attack. Because networked warfare poses immense realism challenges to wargaming, a force development strategy in the modern era demands an especially exercise-heavy process of tactical investigation. Wargames have become more dependent than ever on exercises because exercises can probe whether decisive tactical truth lies undiscovered within the seams of simulation. Exercises are indispensable to wargames because they can provide the important baseline input of the competence of the force. Even though it can be difficult to program human performance factors into a simulation, these are some of the most important variables to know for the sake of realism. By benchmarking human performance through exercises, wargames can have a realistic baseline of how well the force can perform and then build ideas within the limits of that potential. Otherwise, wargames will be misaligned with the training of the force, and can run the grave risk of producing tactics, doctrine, and war plans that are beyond the ability of the force to execute. To paraphrase a certain quote, you go to war with the fleet you trained, not the one you wargamed. This experience points to a fundamental principle of designing military forces: force structure is founded on tactics. How a fleet will be used in war is fundamental to its design, and the shape of force structure is guided by a perception of what capabilities and tactics will dominate. When it appeared advantageous to use aircraft to attack ships, nations built aircraft carriers. When a torpedo fired from an undersea platform could produce a powerful combination of surprise and lethality, nations built more submarines. When aerial threats took the form of missile salvos the U.S. Navy led the way in building warships focused on long-range air defense. When platforms were deemed to have lost their tactical relevance, whether ships of sail, ironclads, or big-gun battleships, nations stopped making them. Three congressionally mandated force structure studies set out to understand what the future fleet could look like, and examined various considerations such as cost, forward presence models, and national strategies. However, while a force structure assessment can be shaped by many factors, the assessment is inherently incomplete if it does not attempt to understand how future tactics and doctrine will define the composition of forces. While the studies took various analytical approaches, the assessment conducted by the Center for Strategic and Budgetary Studies stands out in this regard. 7 It devoted extensive attention to trying to understand the character of future conflict, how capability development is trending across numerous warfare areas, and what new operating concepts may require. All of the studies acknowledged to some extent that visions of tactics and operating concepts are fundamental to designing force structure. Those who favored battleships in the interwar period did not accurately predict their fate because their “theory of war” had failed to keep pace with change. They had a flawed understanding of how future war at sea would develop at the tactical level, especially with respect to how the air domain could dominate the surface domain. The American capital ships that were long expected to be the dominant offensive platform for anti-surface warfare instead spent most of their fleet combat actions serving as ships focused on the defensive anti-air mission. New tactical truth led to battleships being modified in the middle of the war to carry additional anti-air weapons and bolster their defensive firepower. However, their enormous guns, the core weapons that originally justified their construction, were totally irrelevant in this new role. If the interwar Navy had accurately predicted the tactical fate of the battleship would it have built them differently? Would it have built them at all? For all the good the interwar period wargames and Fleet Problem exercises did for the Navy’s force development they often made one major mistake – scripting battles to guarantee a clash between the battleline.9 The potential of the aircraft carrier was rapidly growing, but in the minds of many interwar leaders the fleet combat actions of the era would still frequently feature fights between battleships. Interwar period exercises and wargames were artificially fulfilling this warfighting theory, thereby lending weight to programmatic decisions to procure battleships. It is quite possible that if not for the revealing combat experiences of WWII then navies would have continued building big-gun warships. Modular force structure can act as an insurance policy against the sort of tactical irrelevance that befell the battleship. Modularity helps ease both peacetime force development and wartime adaptation. A “payloads not platforms” approach can help a force compensate for poorly-adjusted warship designs once conflict reveals hard lessons. Deep magazines and the large variety of missile payloads could allow a modern ship to change its mix of capabilities in far less time than it took a battleship to undergo a refit. However, net-centric warfare has made adapting modern warships more difficult in certain respects, even with modularity. A key challenge will be in trying to ascertain how tactical outcomes heavily influenced by ambiguous electronic effects will translate into an ideal mix of capabilities. If defensive electronic warfare or jamming proves to be especially capable at defeating missile seekers then an adaptation could take the form of equipping a different missile loadout. Missile loadouts could also be affected by how well datalinks and network nodes can concentrate fires while being degraded by electronic attack. If the network is less resilient than anticipated, then a new missile loadout could focus on making a warship more independent from forces it would have originally relied on for networked fires. An enduring principle of successful warfighting is optimizing the concentration of firepower. This principle has especially dominated naval force structure, and can be seen in how successive capital ship designs often grew larger and larger to concentrate more firepower. Preferable ways to concentrate firepower through force-wide tactics can also translate into how a fleet is built. Ships of various sizes offer different levels and types of firepower, and the way tactics affect concentration can translate into an ideal mix of platforms. Interwar period navies did not build fleets of only the most powerful platforms in the form of battleships or carriers even though large-scale fleet combat featured prominently in their minds. Rather, their fleets struck a balance between large capital ships and many smaller combatants such as cruisers and destroyers. They felt that their visions of fleet combat created relationships between tactics and concentration that encouraged a degree of platform variety. Optimizing platform variety has become far more difficult in the age of networked warfare because assumptions about network performance can have a powerful effect on designing force structure. Network resilience will strongly dictate the extent to which capabilities can be effectively distributed and concentrated in combat, but the distribution and concentration of capability is also exactly what force structure seeks to optimize. A fleet that is built on a vision of a well-functioning network could very well have a vastly different composition compared to a fleet that anticipates fighting mostly in the dark. To use a modern example, a U.S. Navy cruiser has 122 launch cells and a possible version of the Navy’s future FFG(X) frigate could have 16 launch cells. Would the Navy be better served by buying 20 frigates or 10 cruisers, where the cruiser could cost twice as much as the frigate but has seven times the missile capacity? A well-grounded understanding of how retargeting and engage-on-remote tactics shape a distributed force’s ability to mass firepower should inform such a debate. This is a preview of future tactics and missions, but it hints at a major force development challenge. Requirements for these ships have to try to align with major transformations the Navy has planned. The Distributed Maritime Operations Concept is still in its early stages. The Distributed Lethality concept envisions numerous surface action groups that combine various types of ships into tailored force packages. Networked warfighting can feature various multi-domain tactics and distributed fleet formations, each with a different ability to concentrate firepower and facilitate command and control. Tactics for key capabilities like NIFC-CA, CEC, retargeting, and engage-on-remote will be the bread and butter of networked warfighting. An unprecedented increase in long-range anti-ship firepower is about to hit the Navy as a new generation of anti-ship missiles is fielded. In short, these future ships must somehow reflect the implications of many net-centric tactics and roles the Navy has yet to develop or discover. The Navy’s void of high-end experience is now a critical foundation upon which it is deciding its future. The Navy is led by officers who spent most of their careers in a fleet that failed to train them in sea control, abstained from equipping them with essential weapons like anti-ship missiles, and neglected to give them enough opportunity to test their tactical imagination in exercises. Many of the Navy’s most important wargames and simulations have not been properly tested or refined by real-world experimentation. The Navy has virtually no concrete doctrine for a very complex form of warfare that’s never happened before. This is a recipe for producing flimsy requirements for future capability. However, compared to most other force development missions, the enormous investment that comes with a new generation of force structure should already pose one of the strongest possible demand signals for rigorous at-sea experimentation. The modern fleet should already be acting as an experimental squadron for the future fleet. 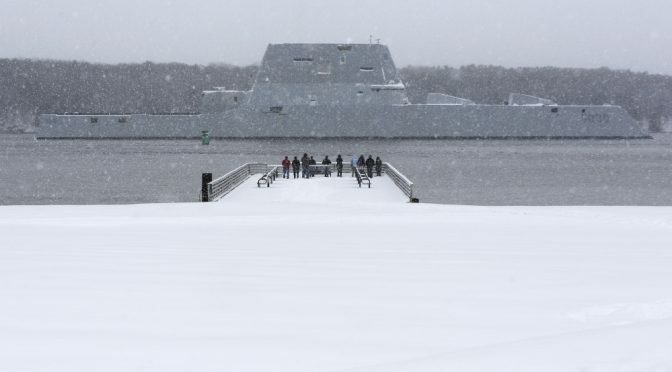 But it appears the Navy is making some of the most important naval force structure decisions of the 21st century without using a series of major exercises to inform requirements. Now the Navy is poised to set sail into the future with a new generation of ships inspired by doctrine born in a simulation, and not in the fleet. The eighth and final part will offer a Force Development Strategy. 4. Peter Perla, The Art of Wargaming, U.S. Naval Institute Press, 1990. 9. Albert Nofi, To Train the Fleet For War, Department of the Navy, 2010. For Wargaming see: John M. Lillard, Playing War, Potomac Books, 2016.